Coins were the gateway to my love affair with the art and wonder of comic books. My dad took me to a coin shop in this small, 1970s-looking shopping center in late 1988 when I was eight years old. It was on busy Pacific Coast Highway in Torrance, California. He wanted to introduce me to his hobby of coin collecting (otherwise known as numismatics). But something else caught my eye that was situated conveniently next door to that coin shop: the most awesome comic shop by the name of Monster Cellar (which sadly does not exist today). The windows of Monster Cellar were plastered with posters of old Universal monsters and superheroes such as Batman and Superman. An air of mystery surrounded the shop because those posters covered every inch of the windows, leaving me awestruck and curious as to what I would discover in the Monster Cellar. I looked around the coin shop with my dad but quickly asked him if I could go next door to the comic shop. Of course, being the greatest dad ever, he allowed me to leave the sanctum of his hobby. I entered my first comic shop that day and was greeted by rows of wooden shelves containing the newest releases and, to my young eyes, tons of comic books that overwhelmed me. The store seemed like a maze of books and toys. Boxes were organized on the floor throughout the store and I stood with my mouth agape. I knew I must have entered Heaven. Cutouts of superheroes and monsters towered over me while I looked at and handled carefully like treasures the myriad comics that surrounded me. The 60s “Batman” series was my introduction to the Dark Knight. The owners of the store were two brothers who looked identical, with big beards and bodies like Hagrid. They were very welcoming and asked me who my favorite superhero was, which was easy to answer: Batman. 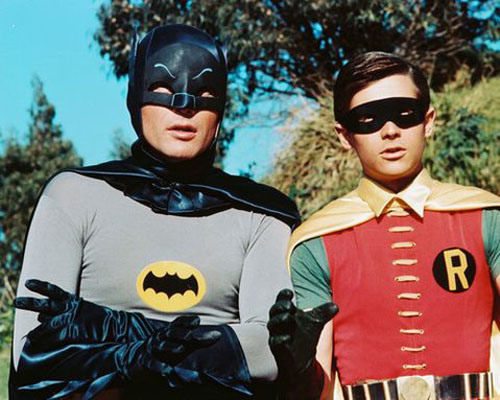 I loved the “Batman” series with Adam West and Burt Ward. I still have my signed and framed picture of my first crush, Burt Ward, that I got from my first comic convention in 1994 hanging prominently in my room. One of the brothers took down the newest issue of “Detective Comics” from the shelves and when I had my first comic in my hand, I knew it was love at first sight. I experienced a smorgasbord of enchantment holding that one comic. Those same feelings I felt that day are still experienced today with each comic I take off the shelves each week. From that day forward, I became passionate about not only Batman, but the greatest art form in the world. Simply from seeing the cover of that first comic I bought, I wanted to know everything there was to know about comics and particularly the character of Batman. 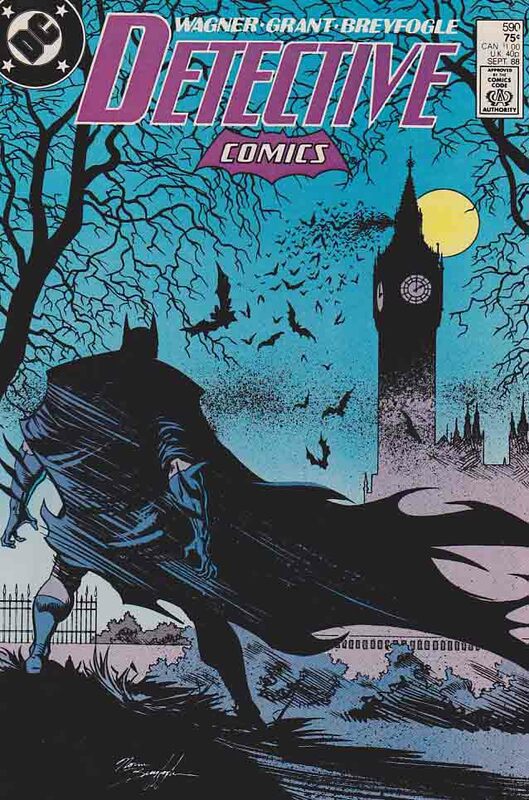 Seeing the artist Norm Breyfogle’s depiction of Batman with his back toward me on that cover staring up at London’s Big Ben signified my curiosity and entrance into a world that continues to enthrall and teach me new ideas and discover new worlds. Through that store and the relationship I built with the owners of the Monster Cellar, I felt a kinship with others like me. I met other collectors and read articles in periodicals such as “Comic Shop News” and “Wizard Magazine”. I was not only participating in a hobby, but I was part of a community. Before then, I always felt alone and like an outcast. Even though I would still feel that way as I grew older, I was aware that my passion for comic books connected me to others. I also felt connected to the character of Batman. Although Bruce Wayne’s life was vastly different than mine on the outside, I could understand his feelings of isolation and passion. I was an awkward child who had found a hero to look up to and (try as I might) emulate. My young mind was opened that day by my first comic and every comic, good or bad, since. I found comic books to be not only an escape, but as a way to broaden my understanding of life and, as a consequence, build my worldview. I was a voracious reader of not only comic books, but prose books as well. Because of this, I discovered new words and looked up their definitions. Aside from that practical aspect of reading, I read books that were considered mature, like “The Dark Knight Returns”, over the next couple of years. My parents were more concerned with me learning about the world than protecting it from me. They knew I could handle what I read and could talk to them about the subjects I encountered in those books. Because of that trust, I devoured literature of every kind and found power through art. If not for my dad and the love of his hobby (which I also dabbled in for a short while), I would never have developed my passion for comic books. After that first comic, I would continue going to that comic shop with my dad every week for the new issues of my favorite titles. After that day, 1988 couldn’t end fast enough and the “Batman” movie could not come any quicker!